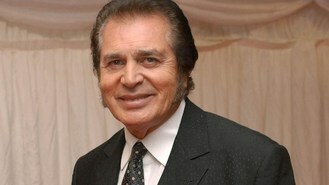 Veteran crooner Engelbert Humperdinck faces tough opposition in this year's Eurovision Song Contest - from some Russian grannies. The 75-year-old star, known for his hits The Last Waltz and Please Release Me, has the nation's hopes resting on his shoulders after being chosen by the BBC to represent the UK this year. And the permatanned heartthrob will not be the only older contestant testing his tonsils this year. A Russian group known as the Buranovo Grannies swept aside glamorous opposition in a bid to represent their country at Eurovision. The eight women beat a double act, including 2008 Eurovision winner Dima Bilan, in a televised show. An outfit from a village in Russia's Udmurtia Republic, the women blend modern pop sounds with their own traditional singing style. The refrain of the Buranovo Grannies' Party For Everybody is in English, but the remainder of the song is in Udmurt, a distant relation of Finnish spoken by some 325,000 people. The 57th Eurovision Song Contest will be held in May in Baku, Azerbaijan. Whitney Houston's lawyer has said her will is a "straightforward" case and he expects no complications. Monkees star Davy Jones has been remembered in a small private funeral in Florida. Lionel Richie and the late Etta James are to be inducted into the Apollo Theater's hall of fame in New York City. Bette Midler's voice has helped turn songs like Wind Beneath My Wings into classics, and now she'll be honoured for that gift. Sinead O'Connor has vowed never to speak about her love life in public again after a "kind of awful" six months. Whitney Houston has left everything to her 19-year-old daughter, Bobbi Kristina. Katy Perry has revealed she is already brainstorming ideas for her next two albums. Bee Gees star Robin Gibb will perform his first ever classical work in a concert next month. A chart hopeful who has been a regular on Radio 2 is giving an unusual guarantee - offering fans their money back if they do not enjoy his live shows.